Seeking to fix a “broken” legal system, a state commission is urging reforms that would remove incentives for local judges to charge guilty defendants court costs to fund court operations and other government functions. But the Michigan Trial Court Funding Commission offers no alternative funding solution should the Michigan Supreme Court, in a pending case, strike down the constitutionality of such costs. “Michigan residents going to court should not face a judge who needs money from a defendant to satisfy demands for court operating expenses,” the commission states in a 43-page report, released Monday. Among its recommendations, the commission proposes the creation of a single statewide fund to collect trial court assessments and general fund payments and then “distribute appropriate monies” back to local courts based on their operational requirements. 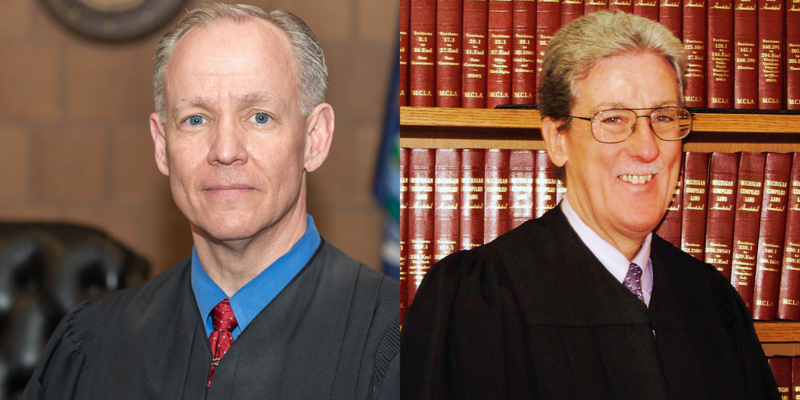 “That money would be sent back to local courts based on what they need to do the job,” commission Chair Tom Boyd, chief judge of 55th District Court in Ingham County, told Bridge Magazine. “After extensive review and evaluation, the commission has unanimously concluded that the existing system is broken, and it is imperative to create a stable and consistent funding source for Michigan trial courts that removes trial court judges from the role of raising money for the operation of the courts,” the report states. Boyd was named in November 2017 to the 14-member commission by Gov. Rick Snyder, along with other judges, lawyers and public officials. The legislature created the commission following a 2014 Michigan Supreme Court ruling that upended funding for local courts. The high court found that state law did not give judges independent authority to impose court costs on criminal defendants. That, the court said, was the role of the legislature. In response, the Michigan Legislature passed a law that same year granting judges the right to collect some of the costs of hearing cases in which defendants were found guilty. While the state pays judges’ salaries, day-to-day court operations are funded by county governments which can pass a portion of these costs on to people convicted of felonies. Critics argue that creates a perverse incentive for judges to find defendants guilty, since courts cannot collect costs on those defendants who are acquitted. Those costs are often siphoned off to pay for other government functions like street lighting and public works needs, sometimes putting pressure on judges to keep revenues high. In 2016, city, district and circuit courts statewide imposed nearly $56 million in court costs; that figure rose to more than $57 million in 2017, according to the State Court Administrative Office. The debate over the authority of judges to impose court costs on criminal defendants goes back nearly a decade. In 2011, an Allegan County man named Fred Cunningham appealed court-imposed costs of $1,000 for his conviction of fraudulently obtaining a painkiller. So the Legislature passed a law that year that explicitly allows courts to charge defendants for personnel and operating expenses related to their case. With the law set to expire in 2017, the Legislature voted to extend it another three years. But it expires in October 2020, leaving the issue up in the air. Last November, the Michigan Supreme Court heard oral arguments on another case that questions court costs assessed at felony sentencing. Shawn Cameron, a Washtenaw County man appealed $1,611 in court costs he was assessed when sentenced for an assault in 2013. A Washtenaw Circuit Court judge upheld the costs in 2015, but Cameron's attorney argued on appeal that it amounted to an unconstitutional tax since it was an “undefined amount” set by the courts instead of the Legislature. Marilena David-Martin, Cameron’s lawyer, protested that the practice allows a court to “raise its entire budget, if it wants, off the backs of criminally convicted individuals” because of the vagueness of the state statute on court costs. Boyd, the commission chair, noted last July that he was told in 2005 that district courts across the state were the "cash cow of local government." Boyd recalled being summoned by the Ingham County Commission in 2006 to explain why he wasn't generating as much revenue as another judge. "The pressure to fund the district court in sentencing is real," Boyd wrote. "It is a potentially corrupting presence in each and every criminal case." Critics say the court system also discriminates against poor defendants by assessing fines for minor offenses they cannot pay. In 2016, a Macomb County judge agreed to end the practice of sending poor people to jail if they couldn’t pay court fines after a woman faced jail for not paying a $455 fine for failing to have her dogs licensed. Commission member Milt Mack, state court administrator for the Supreme Court, said the funding reforms should make it far less likely judges will see dollar signs in cases before them. But the commission report leaves it to the Legislature what should happen should the Michigan Supreme Court strike down costs assessed at sentencing. “Michigan’s trial courts are facing the possibility of a financial emergency due to changes in financing methods brought on by People v. Cameron,” the report states. The report also noted a unanimous February U.S. Supreme Court ruling striking down excessive fees imposed in a property seizure case that could further impact future court funding. Fund technology for local courts. The report recommends the state “bear the cost of all technology” and create a uniform system of document management and technology products for all courts. Establish uniform assessments and centralized collections for all courts, a task it would assign to the State Court Administrative Office. Form a task force, led by the Supreme Court Administrative Office, to develop a plan for a new trial court funding model. “Once the model is implemented, a Michigan Judicial Council must be established to exercise administrative policymaking authority to ensure continued progress toward a unified Michigan court system,” it states. Still waiting for the rationale behind why local judges shouldn't charge guilty defendants court costs to fund courts? If it wasn't for those FOUND GUILTY of crimes, the courts wouldn't be as backlogged as they are today. If you can't do the time (or pay for the damage that you've caused), don't do the crime. Can you supply a link to this report? If you can't buy the dog license it's time to find Fido a new home. "Critics argue that creates a perverse incentive for judges..."
Here we go again, the anonymous 'critics' claim that judges have predilection to being corrupted. When the 'critics' see a convicted criminal being charged for the cost their actions forced on the community as an incentive for judicial corruption [taking money for a self serving reasons] we are seeing a manipulation without proof. As best I can tell from the article the broken part of the system is funding not consistent for the operation of the courts. I don't see how that means the judges are corrupted by conforming to the law when directing the convicted criminal to pay a portion of the cost for their due process created by their actions. As best I can tell, by omission from the article, those who are not found quilty aren't directed to pay for the court costs. Sitting in the hospital now after having a toe cut off because JudgeRoberta Archer in Detroit thought it would be fun to set my bail at 2 million dollars when I complained the Wayne County Prosecutor would not prosecute gay sexual assault. Only having been in michigan 2-1/2 years we are ready to leave this second world state but not before I turn over to the feds and state agencies the corruption in the Detroit PD, Kym Worthy (who is worthy of nothing in the gay male community and 4 different 36th District Court judges for abuse of power and other issues. Came here to teach water law for which I'm an international expert but will not stay in a place that doesn't adhere to the rule of law and is not safe for me and my boyfriend. The corruption is so bad and the sunshine on government so inept it is no surprise why Michigan has moved from a top ten state to bottom 10 in things like crime, education etc. We won't raise kids here. It is a natural reaction to say "charge the guilty party court costs." But in the process of administering justice the defendant should not be seen as a potential revenue source for the court. It clearly could become a prejudicial factor in a judge's rulings or a judge could be accused of the same. When someone goes to court with a lawsuit that is another matter, the person who brings the suit is doing so intentionally and knows the consequences of a failed lawsuit before bringing it. We owe it to ourselves as a society and as individuals who could be brought to face justice that our courts are adequately funded to administer justice fairly and equally among all citizens. The problem is, how do you define adequate or for that matter how do the courts define adequate. Another consideration that should be address is, if a person commits a crime which necessitates the court actions why shouldn't they have responsibility for those costs? And the flaw in the issue as presented in the article, aside from the intellectual exercise, what data, even anecdotal, is there that judges abuse the power to assign those costs to a person convicted, is there any examples of a judge ruling on a case being affected by a budgetary need in the court? I am one of those who actually believes in the presumption of innocence and this article presumes there are judges that are quilty in the assigning of court costs to someone convicted in the court. Don't expect judges to be knowledgeable in all areas of law. They hear some many cases of various degrees they are overloaded with them. Some areas only have one judge to handle all cases. Our judicial system has many problems. R.L. The fact that most of the prisioners being detained in county jails are there because they dont have money to bail out is proof that the district courts are all about the money. Where is the presumption of innocence for these people? I was on probation and destitute just leaving an abusive husband and all my probation officer would say is "You better get the money or you're going to jail". The pressure was so high i started thinking that maybe i should commit crimes to pay them. This was 2009 and finding a job was impossible. They want you to get family and friends to pay. Try showing up to court with no money if you don't think its a crime to be poor.